Heat oven to 325°F. Generously spray 10- or 12-cup fluted tube cake pan. In large bowl, beat all Cake ingredients except apples with electric mixer on low speed 1 minute, scraping bowl constantly. Increase speed to medium; beat 2 minutes. Stir in apples. Pour into pan. Bake 40 to 45 minutes or until toothpick inserted in center comes out clean. Cool 15 minutes; turn upside down onto cooling rack or heatproof serving plate, and remove pan. Cool completely, about 1 hour. Place cake on serving plate. In medium bowl, beat Butterscotch Glaze ingredients with electric mixer on medium speed about 1 minute or until smooth and well combined. Drizzle on top of cake. Garnish with dried apple slices. 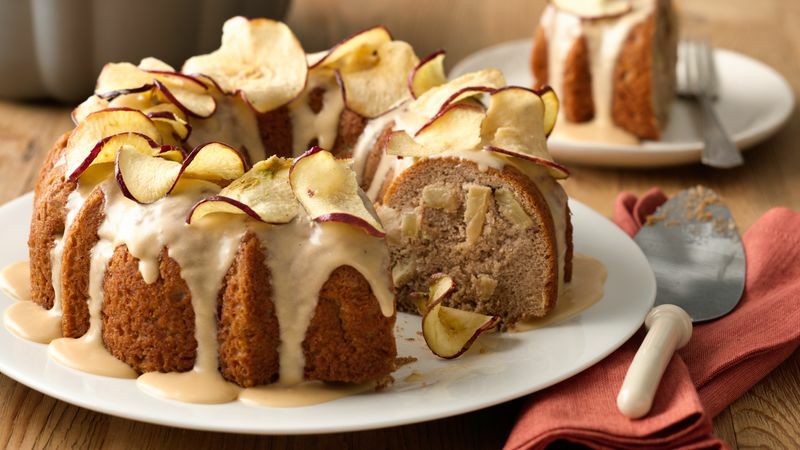 Instead of using spice cake mix, use Betty Crocker™ Super Moist™ yellow cake mix and 1 1/2 teaspoons apple pie spice.